Part A introduces the reader to the different forms of dispute resolution, and examines the differences between arbitration and mediation of trust and fiduciary disputes. The mediation process is explained, including: the role of professional advisors, and the tools and techniques for mediation. 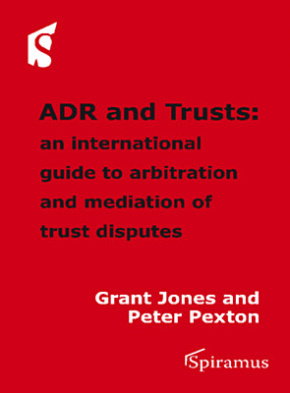 The authors examine ways of avoiding disputes, cross-border aspects of Alternative Dispute Resolution (ADR), the psychological factors affecting mediation, the mediator’s powers to mediate and settle disputes, and ethical issues in Trust ADR. Islamic and Sharia Trust ADR is also considered, with close study of the developing approaches in Canada and the UK. Part B examines 27 jurisdictions and how trust law and ADR operates in each of them. The jurisdictions covered are: Australia, Bahamas, Barbados, The British Virgin Islands, Canada, Cyprus, England and Wales, Florida, France, Gibraltar, Guernsey, Hong Kong, India, Ireland, Isle of Man, Israel, Italy, Jersey, Liechtenstein, Malaysia, Mauritius, New Zealand, Panama, Scotland, Singapore, Switzerland, and the United Arab Emirates. Each profile addresses: arbitration law and practice, trust law, the mandatory requirements for mediation and the enforcement of ADR awards. Grant Jones LLM, New York attorney, solicitor, a Fellow of the Institute of Chartered Accountants and of the Chartered Institute of Arbitrators, is a visiting Nottingham University Law School professor, who practises as both a solicitor and a chartered accountant, in London and Gibraltar. Peter Pextonis a Fellow of the Institute of Chartered Accountants, an Associate of the Chartered Institute of Arbitrators and an active member of the Society of Trust and Estate Practitioners [STEP]. Founder chairman of the Jersey Branch and immediate past chairman of Verein STEP (Switzerland), he now chairs the Membership Committee of STEP Worldwide. Specialising in offshore trusts, estates and tax planning, Peter practised as a partner in the Jersey firm of Ernst and Young, then as a director of Royal Bank of Canada Trustees Limited and more recently as a director of Ganten Group in Liechtenstein.